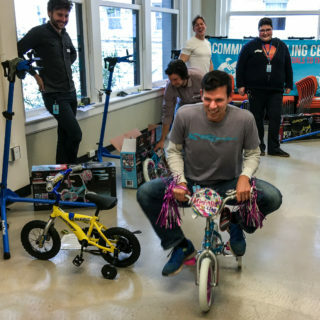 In fall of 2017, an AWS Elemental team gathered to build bikes for the Cycling Center’s Holiday Bike Drive, an annual event during which more than 400 children receive their first bicycle. Following is a recount from AWS Elemental Community Ambassador Emily Barrett. Could you describe what happened at Elemental’s most recent bike build? Most bikes for the Bike Drive are refurbished used bikes. 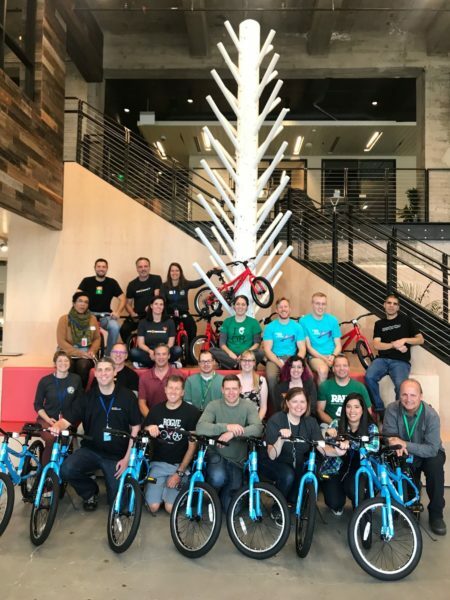 But on October 19th, 2017, 19 AWS Elemental employees got to build brand-new bikes for this annual event! This was the second time AWS Elemental covered the cost of some new bikes for the Drive, and it was a real treat to assemble them. This was a joyful task. It was also—as evidenced by the speed with which we completed it—a relatively quick one. AWS Elementals are fast taskers, especially when it’s something so fun. This is a tradition of relatively long standing for AWS Elemental. Our team has come to the shop on Alberta Street since 2013 to refurbish children’s bikes. We’ve also volunteered as Bike Buddies at the Holiday Bike Drive, and at the Bikes for Kids event in the summer. What did you hear from AWS Elementals who participated? There was a fair amount of joking from both parents about assembling bikes late at night before a holiday or birthday! This activity brought back sweet memories for parents with grown children and anticipatory feelings for those with younger children. Hanna Davis, the Cycling Center’s Volunteer & Events Manager, talked to the team about a bike that recently underwent its third refurbishment during the Holiday Bike Drive. It was amazing to think about a used bike coming to the Cycling Center, and then bringing joy to three more kids (and counting!). Contemplating that story, our team embraced the reminder that that every kid in Portland deserves to experience the pure and wonderful joy of bike riding. Those of us volunteering also found joy in the knowledge that the new bikes we built would likely reach many children over the coming years. There is so much need in the world. Why are bikes for kids from families living on lower incomes a priority? I have to take a step back and first explain how the work of the Cycling Center aligns beautifully with the evolution of Elemental Technologies into AWS Elemental. Founded in 2006, two of the first employee benefits at Elemental were a TriMet pass and safe bike parking. Over the years, supporting bike commuting was always a priority because the Elemental’s founders believed being a good downtown neighbor included a commitment to reduce single-occupancy vehicle trips. It was a natural step for Elemental to start work with the Cycling Center as an “environment” partner in 2006. Today, biking benefits are woven into the fabric of AWS Elemental. It’s part of the AWS Elemental esprit de corps to embrace the joy, health benefits, and connection to Portland that results when we can really feel, hear, smell, and experience it intimately from a bike. The livability of a city is defined in part by how citizens can get around – and the more biking in Portland, the less congestion, pollution, and isolation. There’s no sweeter way to open up the benefits of biking to the whole city than to ensure kids get their first bike, and to see themselves as a city bikers! How is the legacy of AWS Elemental CEO and co-founder Sam Blackman connected to this kind of work? Sam Blackman led AWS Elemental with joyful exuberance and with a deep love for Portland. In July of this year, he volunteered at Bikes for Kids with his family and in 2016 he was part of our first Cycling Center bike build. He closed out the latter build event by taking a little spin around our community kitchen on a very small white bike with pink, glittery streamers! We miss him fiercely. Sam Blackman taking a bike for a test spin. Sam inspired us all to make volunteering part of our schedule. In fact, he included volunteering with all the things on our “have to get done” lists. This has influenced AWS Elemental in a profound way: more than 60% of the Portland team members volunteered for at least one company-sponsored event last year. That is outside of any volunteering they might do on their own! It is said that a company’s culture is the behavior that grows, not just the behaviors recognized with awards or promotions. Volunteering and deepening AWS Elemental’s relationship with community partners such as the Cycling Center is simply part of our culture. It’s just one of the many values Sam taught us. We honor him by continuing to live and abide by them.